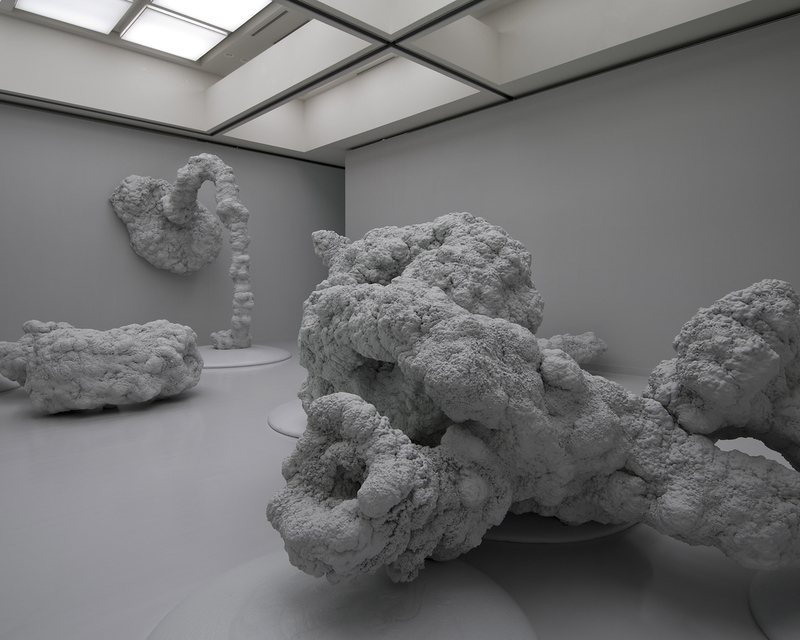 Kohei Nawa, Scum-Apoptosis, 2011, mixed media, dimensions variable. Although Kohei Nawa is still under forty, the Kyoto-based sculptor’s elegant experimental minimalism is well known in Japan. Globally, though, its another story. This comprehensive sampling of his work at Tokyo’s premier contemporary art museum posits him as the forerunner of a new generation. At MOT, viewers wander through a maze of white, grey, or black rooms, with strictly controlled lighting dictating the mood in each. The visitor’s initial encounter with the works is purely sensory: No written information is provided until a complete circuit of the rooms has been made. In a large central hall, huge white figures, which at first sight evoke classical marble sculptures, are merged with copies that have been scanned digitally at a different resolution, creating an eerie double effect. In a much smaller dark room, rectangular white pools of silicon bubble away in a tactile approximation of a working binary database. Elsewhere, Nawa uses a reverse method: Materials applied in a “digital” pattern are released to blur with “analog” unpredictability. Drops of ink dotted on a rigid grid are allowed to evolve naturally into unique circular shapes. Large sculptural forms made with blobs of polyurethane foam are “fomented” into ugly amorphous masses. In the entrance, some netting made with small shots from a glue gun creeps across a wall. Not everything has the wonder effect Nawa seeks. Still, there is an impressive ambition on display here.